Hello! It’s Kati from Houseful of Handmade. 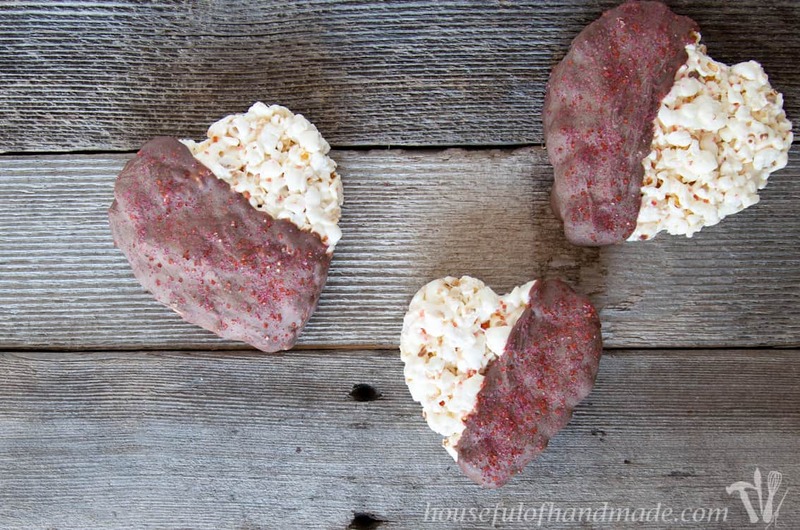 Today I am excited to share the perfect last minute Valentine’s Day treat: Chocolate Dipped Marshmallow Popcorn Hearts! I absolutely love Rice Krispie Treats. I don’t know if it is because I remember making them weekly as a child (they are the easiest treat to make on your own as a kid) or because I really just adore marshmallows of any kind. But for whatever reason, I never pass up an opportunity to indulge in them. I always seem to have one problem when I am craving Rice Krispie treats. I will buy a box of cereal to use, then before I get a chance to make them, my family has eaten the entire box for breakfast. I am not a big fan of cereal for breakfast, but my husband and kids will empty a box in a day. This poses a huge problem for me getting my Rice Krispie treats! Over at Houseful of Handmade I have been indulging in all things popcorn this month with 14 Days of Popcorn! 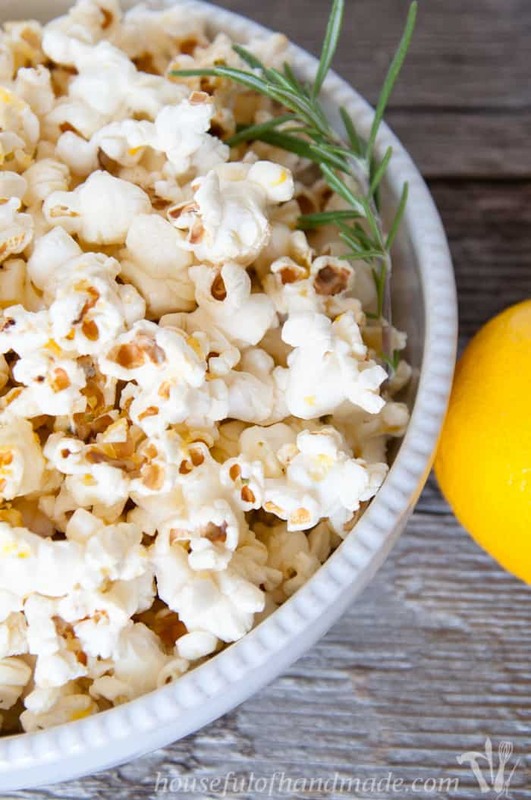 Everyday through Valentine’s Day I am sharing a new popcorn recipe. So it just made sense to fix my Rice Krispie problem with popcorn! I always have popcorn on hand (we have to buy it in bulk we eat so much of it) and it is light and airy just like Rice Krispies. 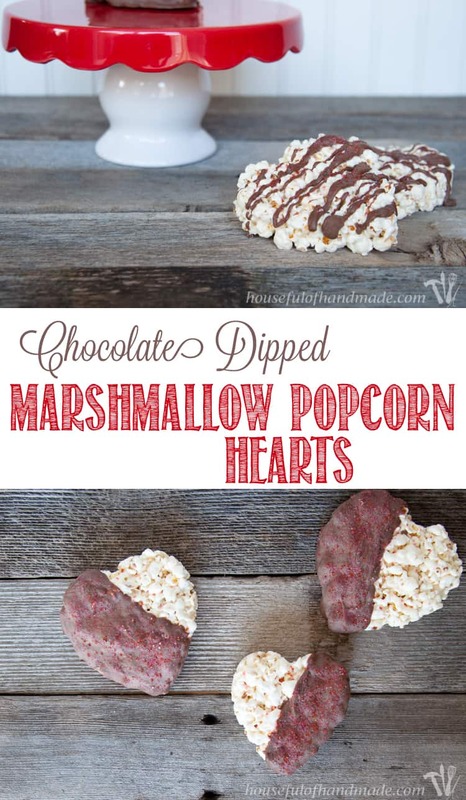 The popcorn worked perfectly to make these delicious Valentine’s Day treats. 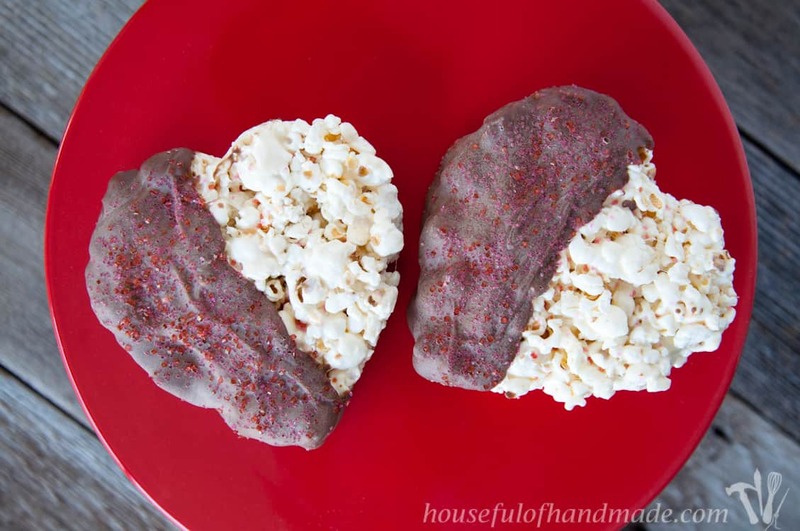 To make these marshmallow popcorn treats perfect for Valentine’s Day, I shaped them into hearts. I have tried to cut Rice Krispie treats with cookie cutters before and learned it doesn’t work. The marshmallow is too sticky and the cereal just crumbles. So I tried something new to make my marshmallow popcorn treats into hearts, after you mix the melted marshmallow into the popcorn, press it into greased cookie cutters to shape. It is important to grease the cookie cutters and your hands well so you don’t get all gooey. But after you press one heart you can remove the cookie cutter and do the next one. Easy peasy and my hearts look perfect. After letting the hearts cool, I dipped the hearts in melted chocolate or drizzled them with melted chocolate then added a bit of sprinkles for Valentine’s Day. Now we are ready to enjoy our new popcorn treats or give them to our Valentine. They are perfect. My kids (and me) can’t get enough! 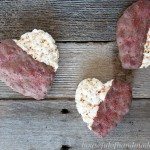 The perfect snack idea to share with your Valentine! 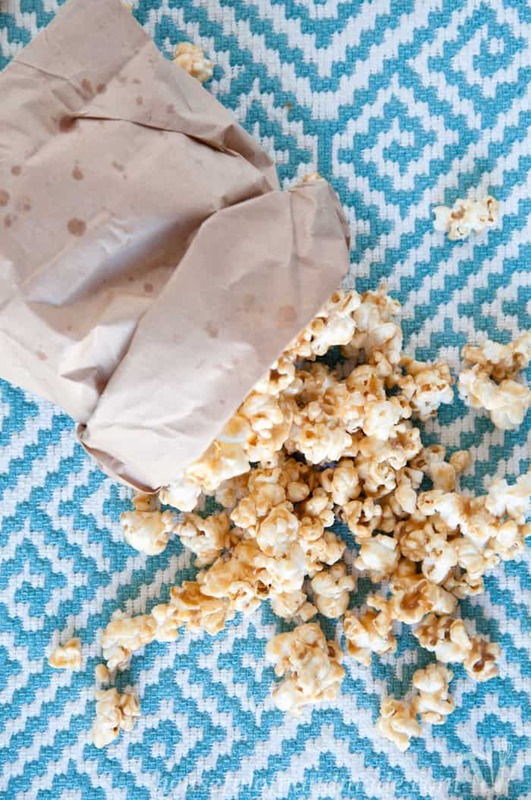 Break up popcorn a little bit by rubbing it between your fingers. Set aside. In a large microwave safe bowl, melt butter. Add marshmallows and stir. Microwave on high for 1-1 1/2 minutes until marshmallows are puffed and melted. Stir until smooth. Mix in popcorn and stir until evenly coated. 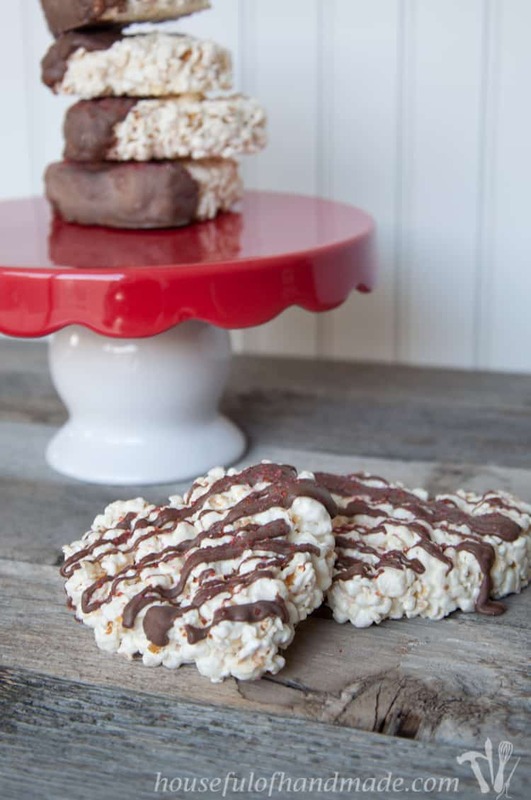 Press the marshmallow popcorn mixture into greased cookie cutters. Allow to cool completely. 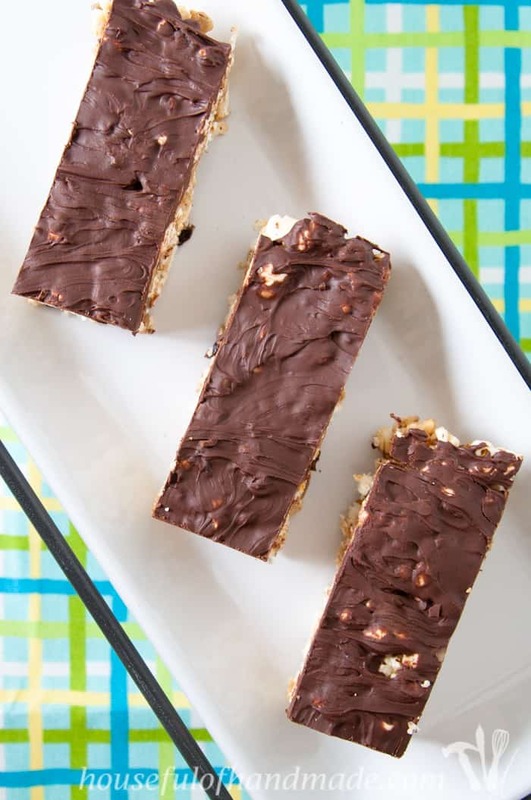 Melt chocolate in a 30 second intervals in the microwave. 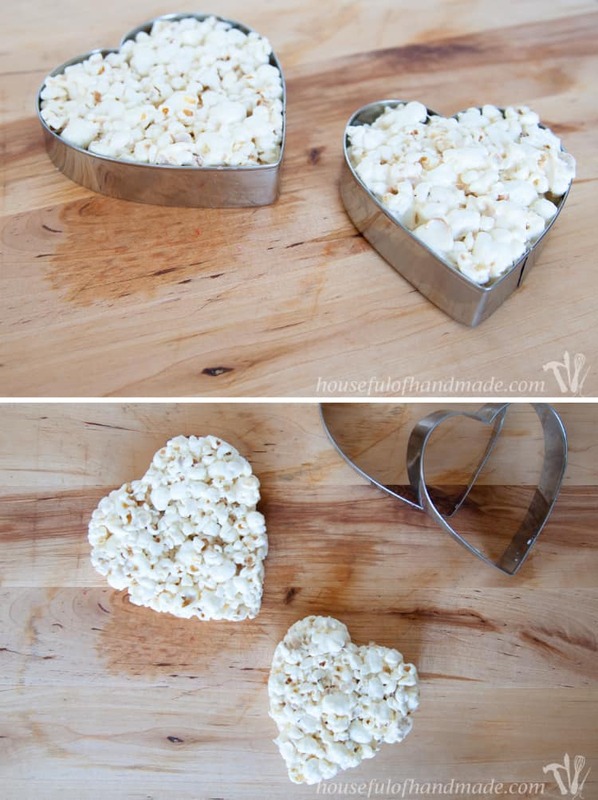 Once melted, dip the hearts in the popcorn and place on parchment paper. Add sprinkles before chocolate hardens. And don’t forget to check out all the other fun popcorn treats I have been sharing in the 14 Days of Popcorn series. Here are a few of my favorites.